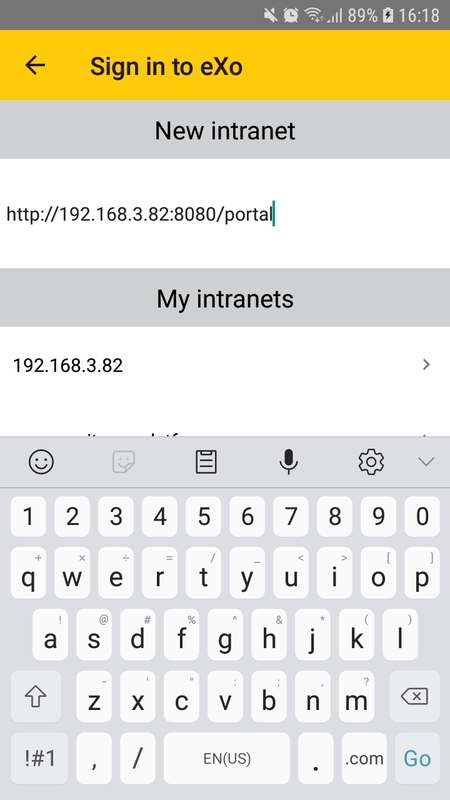 This chapter describes how to configure eXo Mobile app to connect with a Platform site. The Platform site can be eXo Cloud, eXo Community or your own Platform installation (called on-premises in this document). In a nutshell, the prerequisite is you have an account on the site already. You will configure the app using this account. The app supports multiple accounts and you can rotate between accounts easily. You must have an account on either of our services, or your own on-premises installation of Platform. 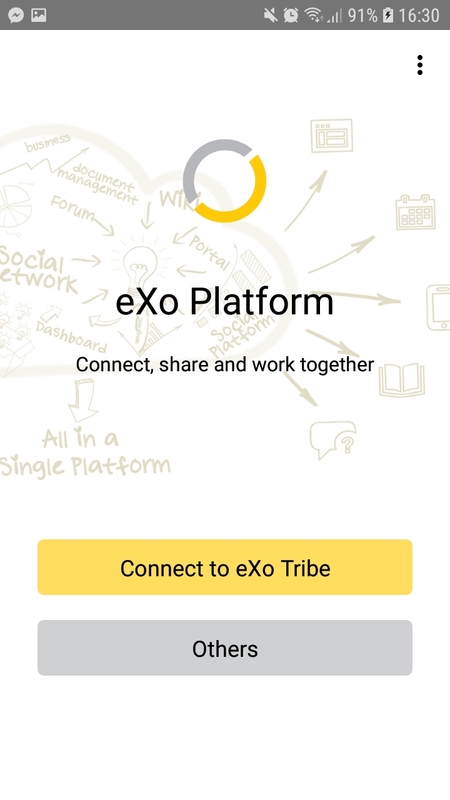 eXo Community is the website where you can interact with eXoers and the eXo Tribe to get news, answers for your questions, and community support for your problems. It is not however a place to store your own data or your organization’s data. To create an account on eXo Community, visit the community register page. There, you can type in your information to register a new account. 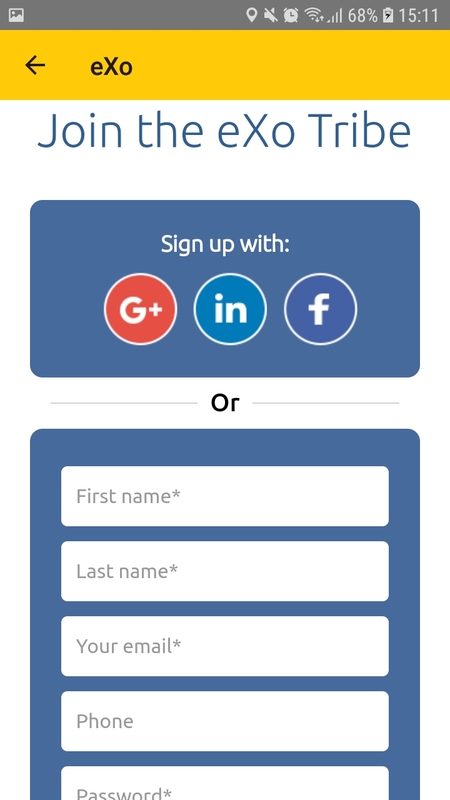 You can alternatively register in one click with your LinkedIn, Facebook or Google+ account. 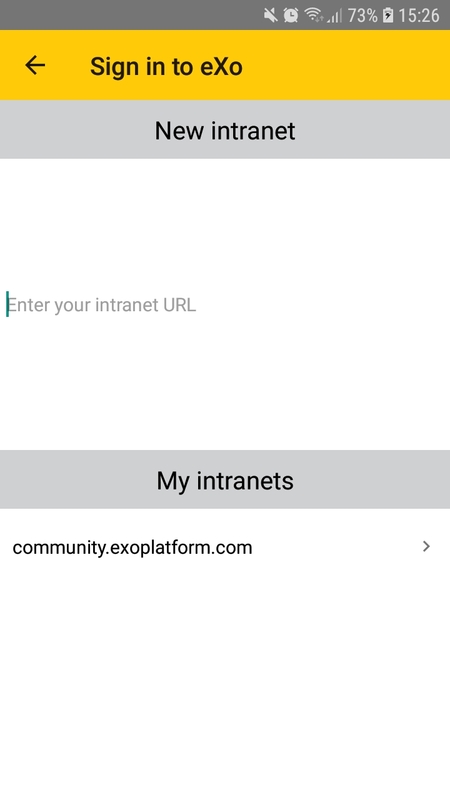 In case you registered with your LinkedIn, Facebook or Google+ account, the procedure to connect via eXo mobile application is different. Refer to this discussion for how-to. eXo Platform Tomcat bundle (Tomcat). Install and run your server. Follow the Installation and Startup guide. 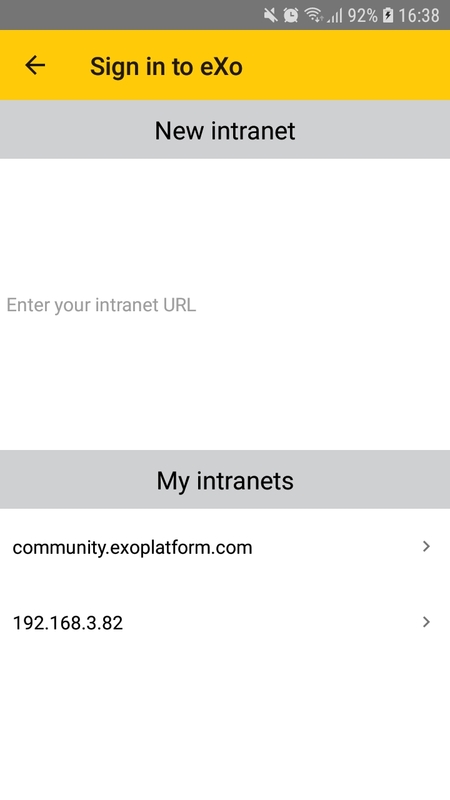 This page describes how to configure your eXo account on the mobile application. It requires you to have an account on either eXo Cloud, eXo Community or any on-premises eXo Platform installation. Please follow the previous page if you have not one yet. Though the screens you see here illustrate iOS app, the Android app is similar, except that there is no Settings button on the app screens. Instead you tap the device’s menu button that will open an on-screen menu and you can find Settings there. 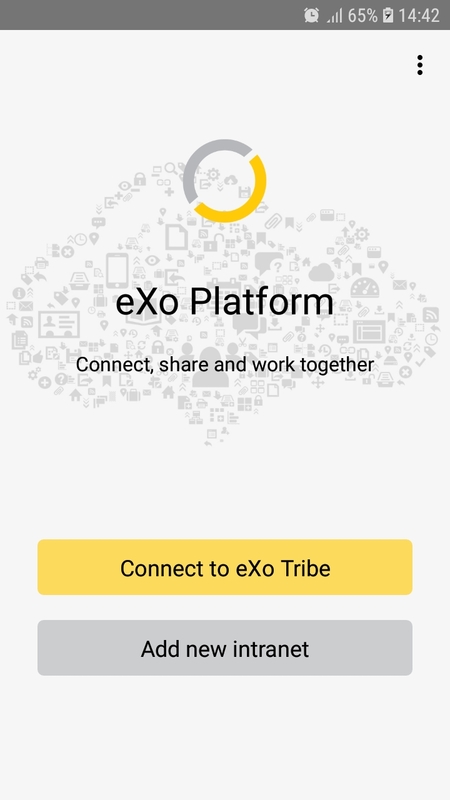 From this screen, you can connect to eXo Tribe or add a new intranet. 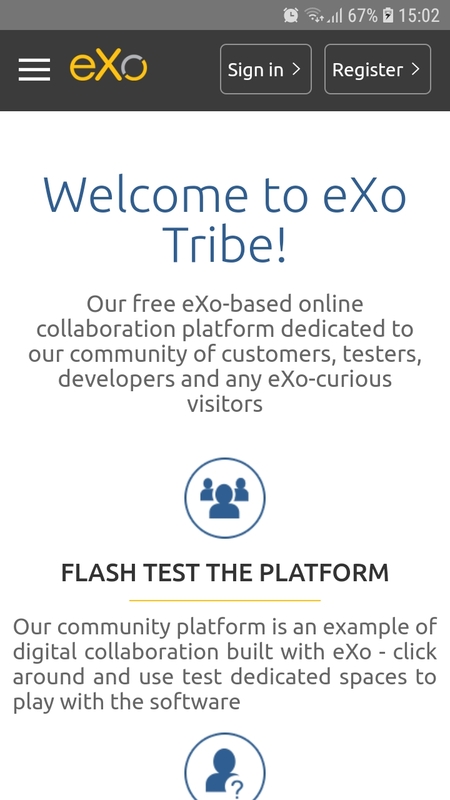 Click the Connect to eXo Tribe button, you will be redirected to the tribe’s login screen. If you already have an account in eXo Tribe then you click on Sign in button. Fill in you credentials to be redirected to the tribe’s activity stream. If you don’t have an account in eXo Tribe then click on Register to be redirected to the join form. Fill in the needed fields to create your account. Enter the URL of your intranet and click on Go. You will be redirected to your intranet login page. Type your credentials to go to your intranet activity stream. When you configured for the first time, you are automatically signed in. This page describes what you see when you open the app later on, and you need to sign in with an existing account. Select one of the existing intranets to connect to. 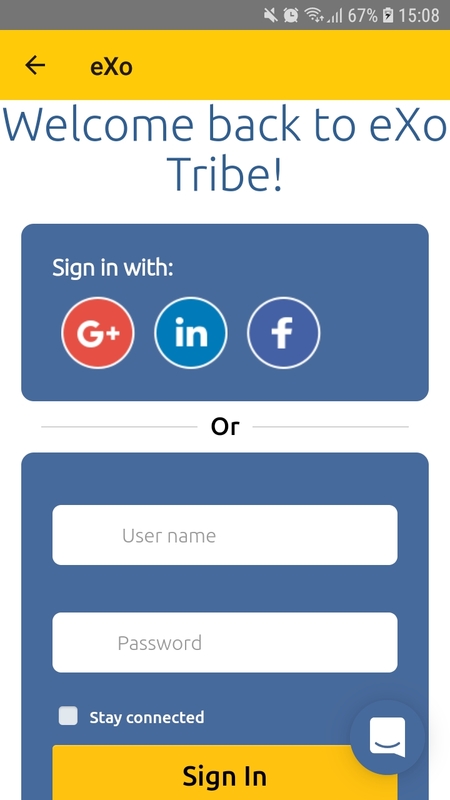 To sign in, enter your username and password and tap the Login button. If you activated the remember me option, your username and password are already filled in, you just have to tap the button.